Directed by Judd Apatow. Produced by Judd Apatow and Barry Mendel. Written by Amy Schumer. Release date: July 17, 2015. Trainwreck is a testament to the idea that a comedy can succeed purely on the basis of its, well, comedy. It can be a movie that has so many flaws that when you list them on paper you find yourself in shock, but if it's making you laugh enough while it's playing, you'll still have a good time. This is true of Trainwreck, which is so incredibly funny despite having so many glaring flaws. You'll be laughing for most of its running time, but looking back at it you'll start to notice that it's not the greatest thing in the world. 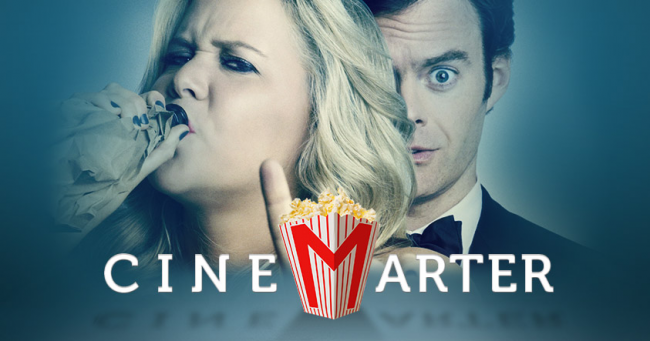 Amy Schumer makes her big-screen leading role debut in Trainwreck, playing Amy Townsend, the titular "trainwreck." Schumer also wrote the film's screenplay. As a kid, Amy was told that monogamy isn't a good thing, and as such hasn't been able to maintain a proper romantic relationship with anyone. She's now a writer, and is told to do a piece on Dr. Aaron Conners (Bill Hader), who is essentially her exact opposite. If you've seen one romantic comedy in your life, or if you're good at guessing, you'll probably figure out what happens from here. The amount of cliche one can find in Trainwreck is a little startling. This is your standard rom-com, just with a lot more profanity and intelligence. Will Amy and Aaron fall in love? Of course they will! Will there be a big fight over something ultimately meaningless that will make us question whether or not they can be together? Duh! Will one of the two make a big, last-ditch attempt to salvage the relationship? What do you think? You could write this sort of thing in your sleep. What requires more talent is in the individual scenes, in the dialogue, and at the pointed humor aimed at various targets. Schumer's style of comedy isn't exactly the nicest out there. It's sharp, it's a little controversial, and it's dirty. Most of it works. There are a few jokes that don't really hit, but that's true of almost every comedy ever. Some scenes also go on way too long, with characters just continuing to rip on the same subject way past the point that it's enjoyable.